Late March, 2012 I arrived in Memphis, Tennessee to see the battlefield at Shiloh, its environs, and a reenactment in nearby Michie, TN, commemorating the 150th anniversary of this epic battle in 1862. 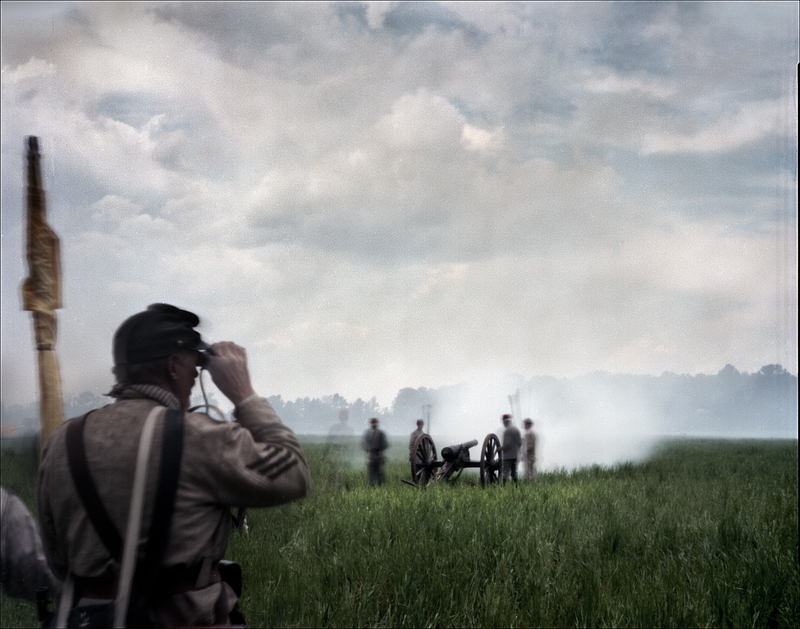 The event was sponsored by the Blue & Grey Alliance, a southern reenactment group and would be the first big reenactment for the Civil War 150 Pinhole Project. Driving through the rural countryside in southern Tennessee you are struck by the abundance of beautiful land – primal forests broken by old farmsteads and a myriad of streams and creeks all leading to the Tennessee River. 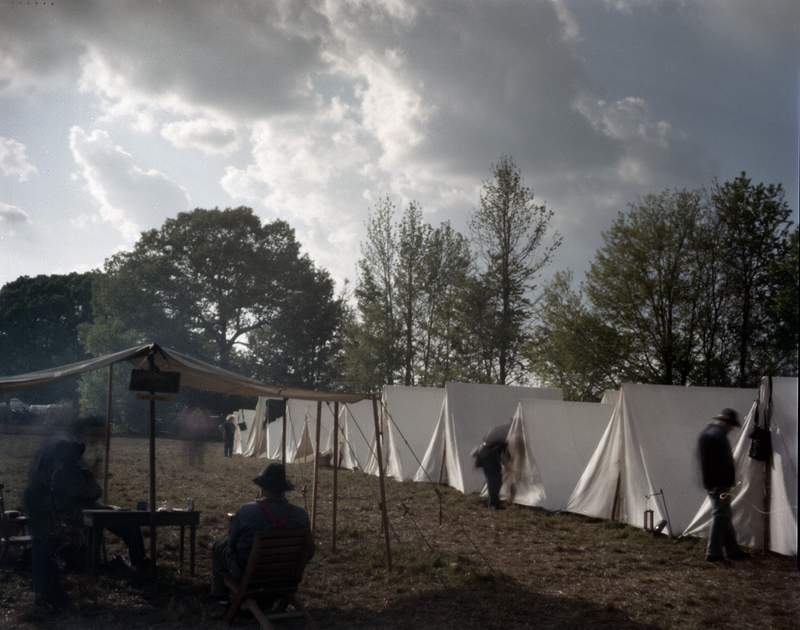 Standing in the woods of Tennessee, the trees leafing out, the smell of spring rain, watching re-enactors set up camp I felt like I was beginning to step back in time…. Thousands of re-enactors would participate in this Shiloh reenactment and the event would draw thousands of spectators as well. The ground chosen for this reenactment- a large farm in Michie-, was just a mile or so from the actual Shiloh Battlefield and was wonderfully diverse with open fields, meadows and tracks of woods . The wooded areas would serve as the army camps during the reenactment, the re-enactors marching from camp to a central open field where the “battles” would take place. Its 85 degrees . The men are dressed in wool….. the battle begins. Within an hour, their exertions make the re-enactors, faces smeared in black power, look like hardened veterans. 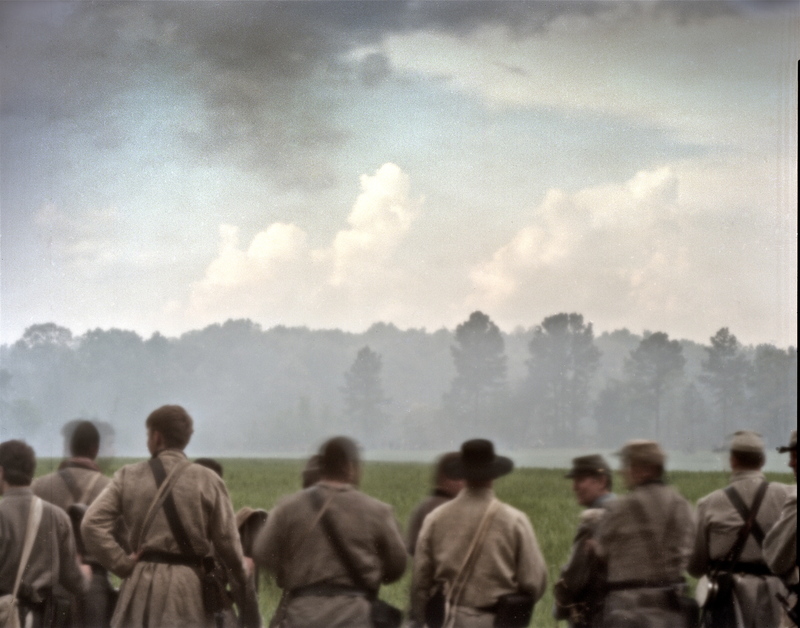 I silently watched as a company of Confederates form-up in camp, check their weapons and march to the “battlefield”. The sound of hundreds of boots, in cadence, on a dirt track, is curious and is a sound familiar to any veteran, from any time. One of these confederate re-enactors began to sing “Dixie” with the entire company taking up the song as they marched. A chill went through me as I listened to the muffled sounds of cannons firing in the distance, as they marched towards the sound of the guns….. This battle (my first reenactment for the project) would introduce me to this dedicated subculture of Americans. The attention to detail among the re-enactors is impressive . Sleeping in canvas tents, cooking on open fires, uniform regulations apply, right down to the smokers: cigars and hand rolled cigarettes only. 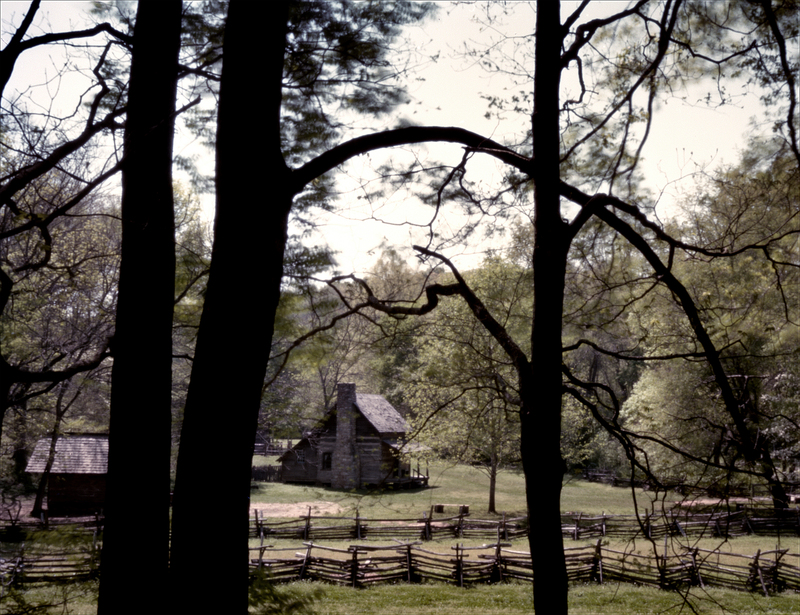 Civil War reenactments generally include a “sutler village”. Sutlers were merchants that followed the armies in the 1860′s selling their wares to soldiers in camp. The modern-day sutler village performs the same task for the re-enactors, the small tent city providing re-enactor clothing, a black smith for repairs, and other merchants including an old fashion lemonade and root beer stand. The light over the weekend for the reenactment was dramatic. A thunder-storm rolled through during the battle producing a little rain, but great cloud formations. The photographing was challenging being a spectator, my access was limited and it was here at Shiloh that I realized that to get the images I wanted for the project – from the soldiers perspective – I would need to become a re-enactor myself. 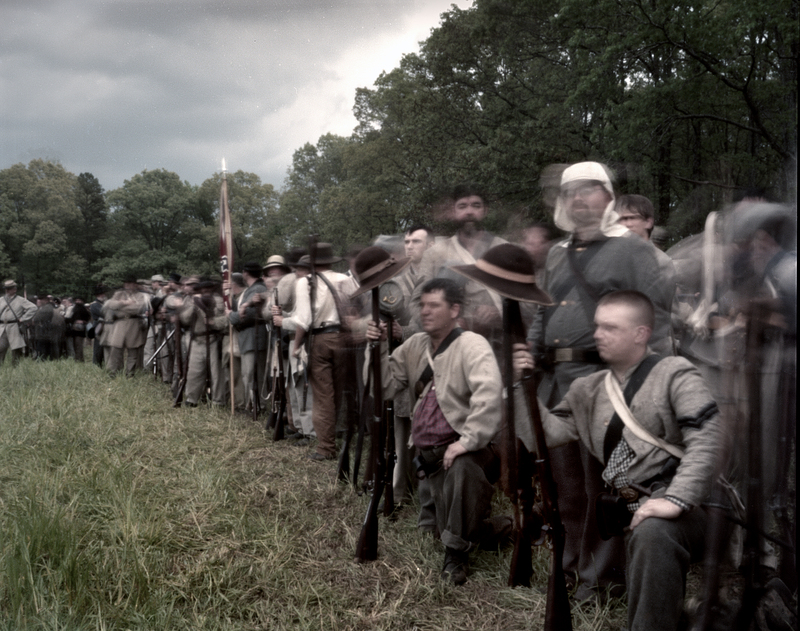 After this weekend reenactment I would have a few days to explore Corinth and areas around Shiloh. I visited Fort Donelson on the Cumberland River in Dover, TN, site of one of US Grant’s first victories as a commander. Travels along the Natchez Trace, the old wagon road that took early americans west, would be in order. 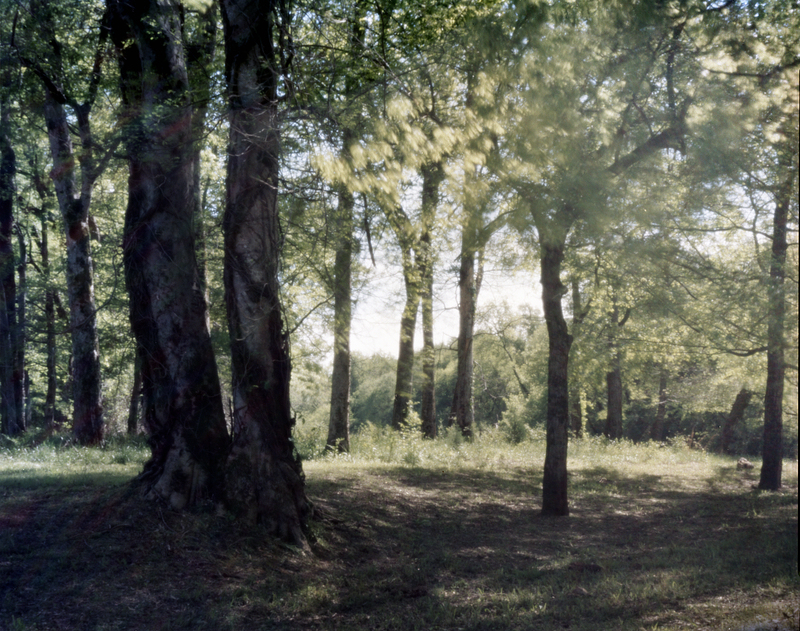 The Battlefield at Shiloh is a giant primal forest. 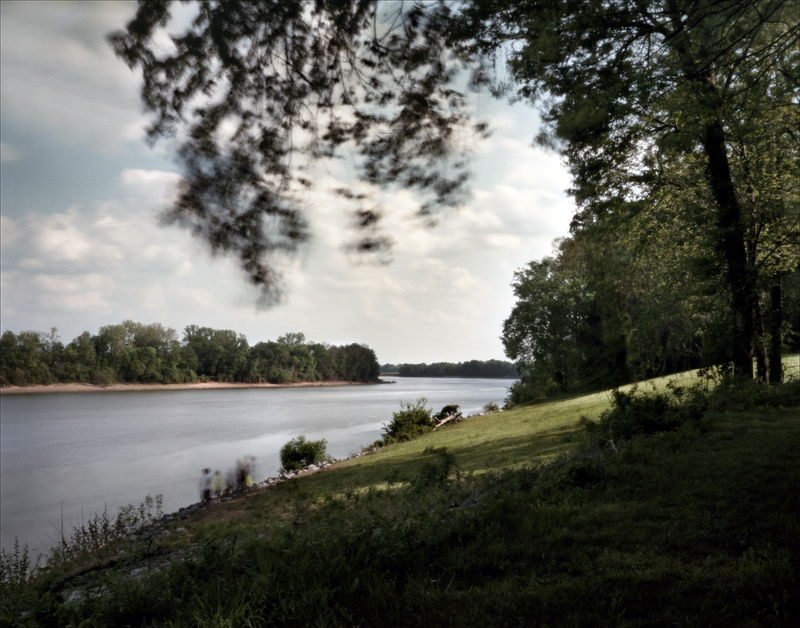 Located on the banks of the Tennessee River, the battlefield was preserved by the veterans of the battle in the 1880s, saved by the men who fought there. 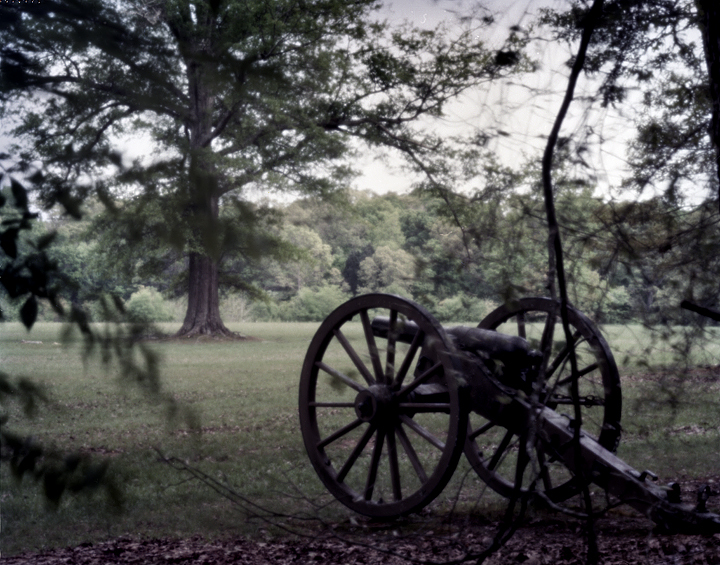 In this sense Shiloh has remained as hallowed ground, undeveloped, since the end of the fighting in April of 1862. The Battle of Shiloh happened over two bloody days on April 6th & 7th of 1862. The Confederates launched a surprise attack on the Union camps at dawn on April 6th, by the evening of April 7th there were over 23,000 dead, dying and wounded men on the fields at Shiloh. When news began to spread of this great battle, a hush came over the Nation. We had fought our own Waterloo and sadly, many realized there would be many more Waterloos to come. In two days fighting at Shiloh there were more casualties than all the wars Americans had fought, put together, since the Revolution. The battlefield is quite large, sections where fighting took place can be miles apart. Shiloh was the battlefield where I first understood what a mile long battle line might look like. The idea of fighting men arrayed over a mile is something I could not wrap my head around, what would this look like? Walk the Sunken Road at Shiloh and you will begin to understand what this meant and what it might have looked like. That Sunken Road stretches for nearly a mile, going through forest to open meadow, the union battle line clearly visible today. Shiloh as a primal forest is heightened by the fact that the battlefield also contains the evidence of an 800 year old Native American Indian village. Evidence of old clay pits and numerous ceremonial mounds dot the preserved site. 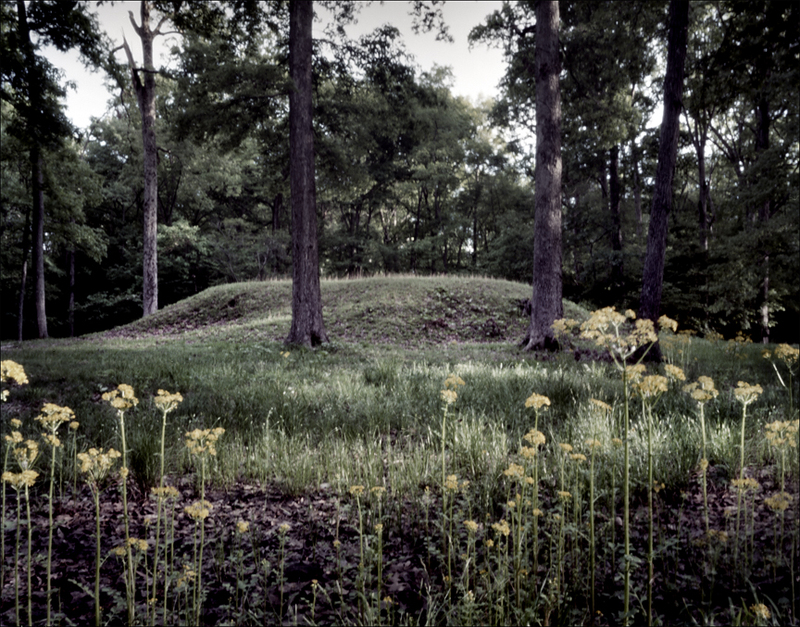 These ceremonial mounds played a part in the battle of Shiloh. It was from one of these mounds that confederate Nathan Bedford Forrest viewed Union army reinforcements arriving the night after the first days fighting at Shiloh. 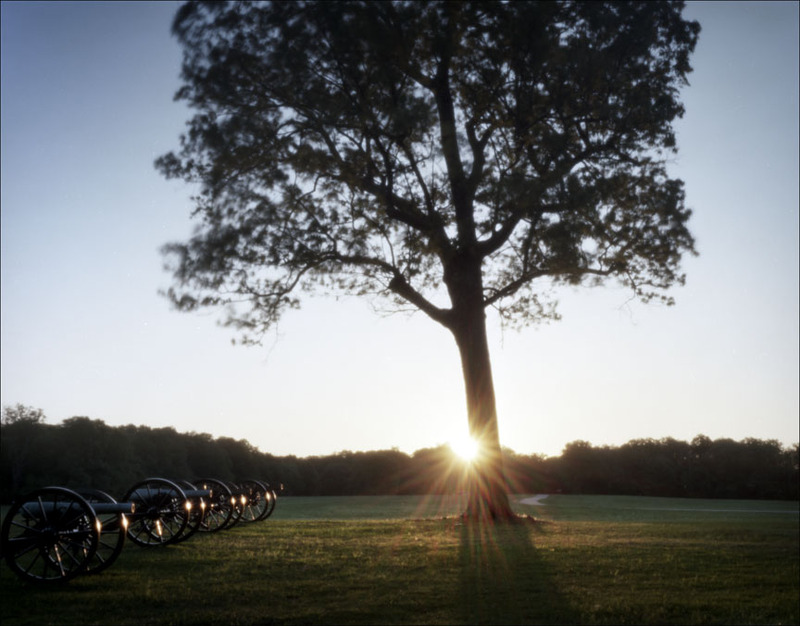 Walked into Fraley Field at sunrise on April 6th, 2012 – 150 years to the minute – the scene of the first shots fired at the Battle of Shiloh. 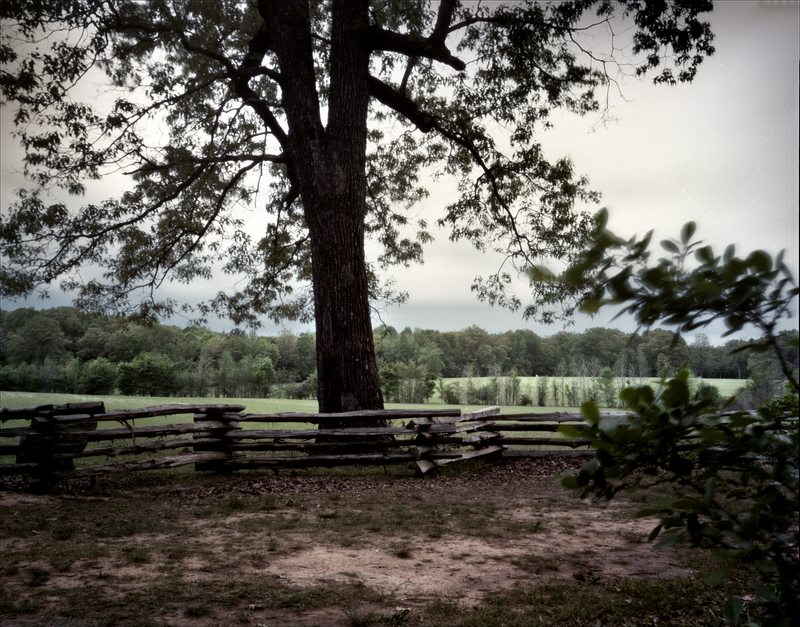 The tree line where confederate forces were deployed is clearly seen as you enter the field from the north. These first shots signaled the beginning of two days of intense fighting. 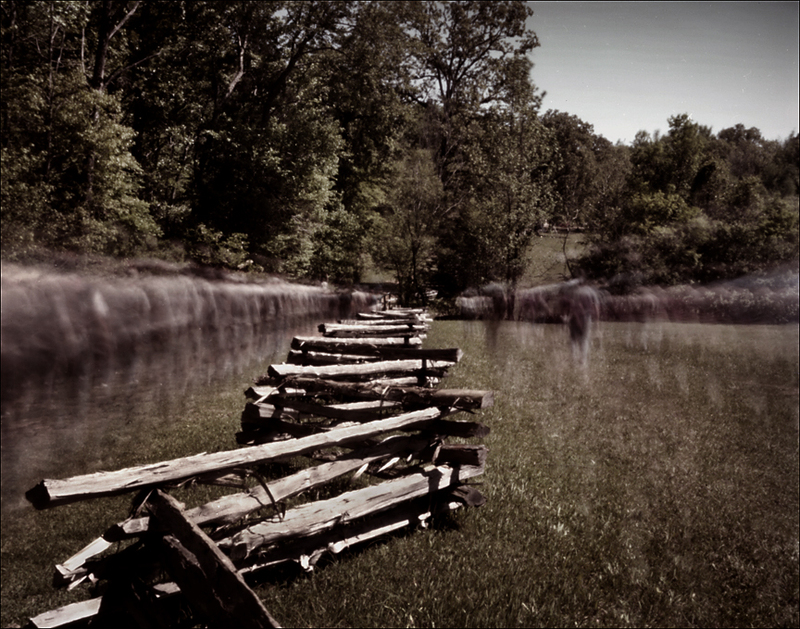 The Battlefield at Shiloh is run through with creeks and ravines leading to the Tennessee River. It was these ravines and the thick brush that surround these areas, that made fighting at Shiloh in 1862 so confusing and deadly. After reading a good deal about this battle I was particularly interested in seeing the Dill Branch Ravine. 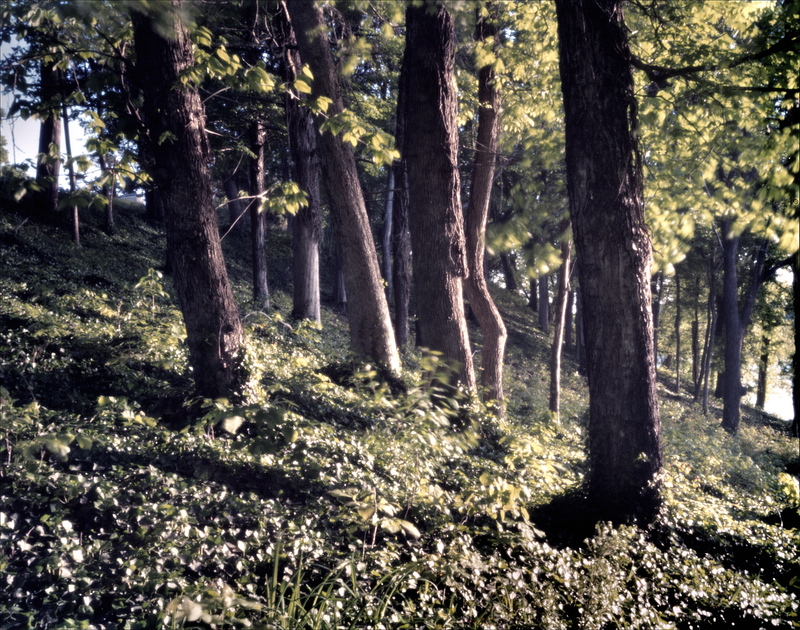 Situated between the Indian village and Pittsburg Landing, this ravine is notable for stopping the confederate attack on the first day of the battle. I wondered, how could a ravine stop a determined group of soldiers from moving forward? I needed to see this battlefield feature to try and understand what the soldiers experienced that day. Chatting with a local before entering the ravine, he said, “watch out for snakes!” Right, so running through this nightmare of a landscape, being shot at wasn’t enough, you had snakes to contend with as well! After exploring this ravine, slipping and falling a few times on its slippery, mud and wet-leaf covered interior, I quickly came to realize the deadly aspects of such battlefield topography. 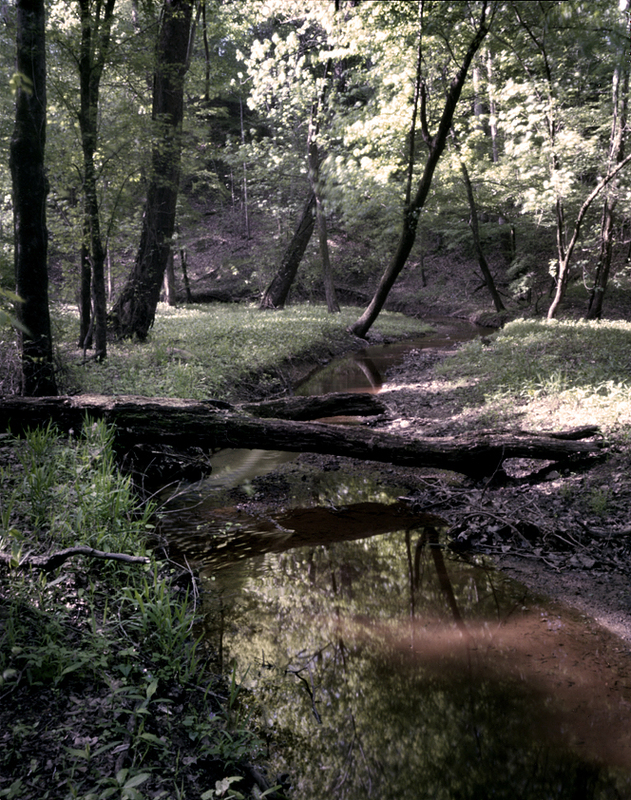 Union troops, attempting to escape the confederate attack, descended into this ravine and were shot down as they slogged their way through this difficult ground. The creek was low when I explored the ravine, thankfully, but it was flooded in 1862 when Union troops got pinned down here. It’s clear why the Confederates stopped at the lip of this ravine, and lucky for the Union Army that they did. Just on the other side of the Dill Branch Ravine is Pittsburg Landing, the Union Army’s base of command during the battle. The Hornets Nest or Sunken Road at Shiloh. Seen of intense fighting in 1862. Standing in the Sunken Road at Duncan Field Union soldiers looked out across an undulating field, a mere 100 yards, to the tree line where the Confederate forces were deployed. The intense fighting here would lead the soldiers to nickname this section of the Sunken Road “the Hornets’ Nest”. Fighting at the Sunken Road intensified all day with multiple Confederate attacks on the Union position. During a brief lull in the fighting Confederates arrayed over 60 artillery pieces and began to hammer these Union forces firing directly into the Road. At about 5:30pm on April 6th, 1862, Union troops held this ground until they were completely surrounded. Confederate forces eventually captured 2,000 Union soldiers here but fighting at the Sunken Road and the nearby Peach Orchard helped slow and eventually stop the Confederate attack. 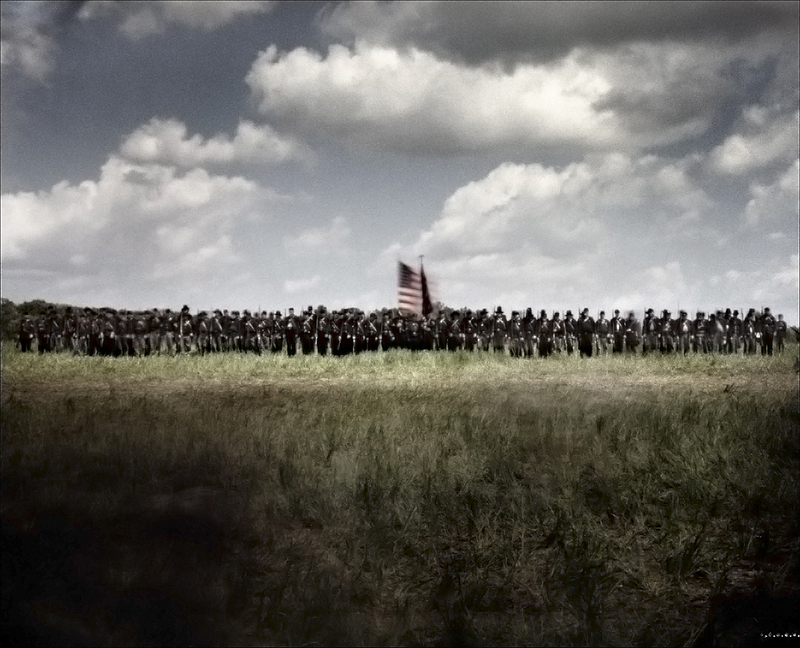 As the fighting died down and the sun set on April 6th Confederate forces took advantage of the Union camps they had overrun that day and planned on renewing their attack the next morning. But the Confederates were in for a surprise on April 7th as Union General US Grant, receiving reinforcements overnight, launched a crushing counterattack that eventually send the Confederate forces retreating back toward Corinth, Mississippi. While walking along the retaining wall at Pittsburg Landing I had an experience that brought this conflict rushing into the present. I noticed something out-of-place on the ground. Picking it up I realized I was holding the remains of an artillery shell fragment from the battle last touched and fired in anger 150 years ago! Holding this shell fragment in my hands, I could almost hear the report and explosion of the shells, it appeared to shake in my hands. I dug a small hole and reburied the artifact. Somewhat shaken the experience clearly illustrated the idea that the past is present. After 150 years, Shiloh is still giving up it’s ghosts. 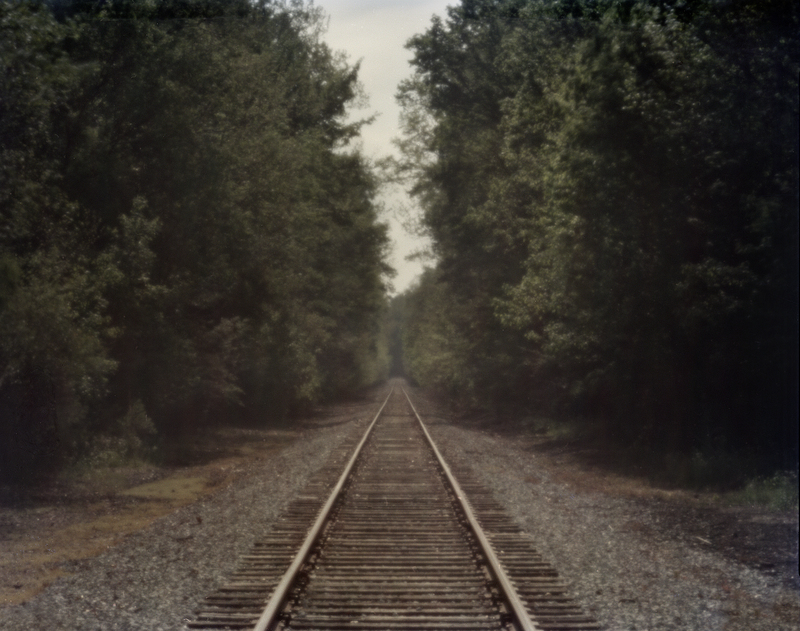 A visit to Corinth, Mississippi, the confederate railroad hub and the impetus for the battle, reveals a now quiet northern Mississippi town with much evidence of it’s 19th century past. The crossroads at Corinth, the coming together of the Mobile & Ohio and Memphis and Charleston railroads, is still here with the restored 19th century rail station, now a museum, intact. 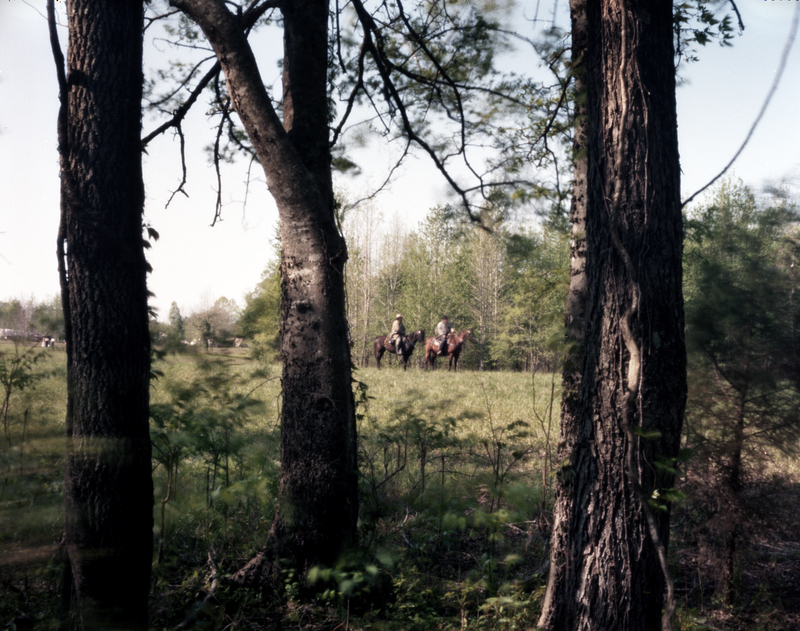 Travels along the Natchez Trace, the old wagon road that led american settlers west, was familiar to soldiers in the 1860s. I stopped to see a group of nameless confederate graves along the Trace in Mississippi. These unfortunate soldiers were most likely wounded at Shiloh and died during the retreat in the days following the Battle. My trip ended with the Battlefield Illumination. The Park Service, to give visitors a concept of the numbers of dead and wounded , covers the battlefield in luminaries, one candle place along the road for every casualty at Shiloh. Driving through the battlefield at dusk, with 24,000 of these luminaries spread across the fields was heart rending. The candles go on and on and gives one a sobering view of the carnage at Shiloh. Three excellent source books on this battle, “Shiloh”, by Shelby Foote, “Shiloh and the Western Campaign of 1862” by O. Edward Cunningham and “Company Aytch” by Sam Watkins. The next stop on this journey is to the Shenandoah Valley in Virginia. this may sound corny, but this collection is thrilling. Thank you for it. Michael, it was a pleasure and an honor to met you at Clarksville, TN at the STA convention October 17, 2013. I love the pictures you have captured at Shiloh. It is a very haunting place, and one our favorites in the world. My family and I had one of those “moments” at Shiloh in the Peach Orchard area at the Manse Cabin. This project is definitely a labor of love, but a much appreciated one by us! Thank you for sharing! If you find yourself back in West TN with a little time to kill, don’t forget about Pilots Knob & Johnsonville. You might find yourself in the middle of sinking a gunboat from the highest point! hello. Thanks so much for attending. 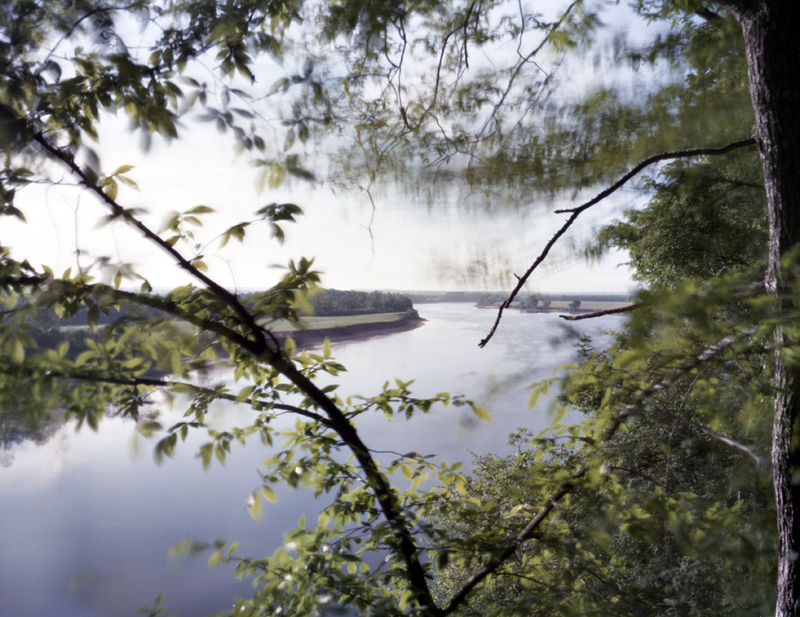 Ill be posting a few pinhole photos from Clarksville and Stones River in a day or so. Stay tuned! I am surely bookmarking this website as well as sharing it with my friends.